I was reminded of this saying when it was quoted by a lady in the audience for a recent presentation on Ozark superstitions sponsored by the Carroll County Historical Society. Susan Young, the Outreach Coordinator for the Shiloh Museum of Ozark History in Springdale, was the entertaining speaker. For a reference, she used Vance Randolph’s 1947 classic Ozark Magic and Folklore and she read the opening line that “The people who live in the Ozark country of Missouri and Arkansas were, until very recently, the most deliberately unprogressive people in the United States.” As a group we contemplated whether or not there was an implied insult. I don’t believe that there is as Vance Randolph, a one-time resident of Eureka Springs, loved all things authentically Ozarkian. Susan Young began the evening talking about the old belief that a cat will take away a baby’s breath. Cats used to have their necks broken for acting suspiciously around newborns because of this saying. If you drop a dishrag, company is coming. In my mother’s family, if you drop a case knife, company is coming. Many of the old beliefs of the Ozarks, of course, came from other places. The hills of Kentucky, Tennessee and North Carolina, shared many of these beliefs as so many settlers to the Ozarks originated from these states. Frequently, the old superstitious sayings had to do with luck. For instance, if you find a horseshoe in the road and the open end is towards you, spit on it and throw it over your left shoulder for good luck. If the closed end is towards you, you’d better keep walking. Susan Young asked if anyone had a buckeye in their pocket for good luck and two did. I used to carry a buckeye around until I lost it, which I suppose could explain a great deal. I’ve been perusing some old editions of the Eureka Springs Times-Echo again. Sometimes I’m amazed at the minutiae old newspapers reported. For instance, we learn that in July 1971, Howard Easley mowed the grass at the Roach Cemetery near Eagle Rock. This was not told in the context of another larger story, it was a simple stand alone statement that might interest the readers. Also, in July 1971, the Eureka Springs Chamber of Commerce announced that in the coming September, the First Annual Antique Car Show would be held with a parade and car displays. Then it says, “The rest of the afternoon will be used for the gorilla hunt with quite a bit of hillbilly action on the streets.” I really don’t know what that means. In a continuing saga, Bob Vargo of Yellville was arrested twice in two weeks. His three children had previously been hired to perform nightly at the City Auditorium during the 1971 season, but, following an unspecified dispute, the contract was terminated. Mr. Vargo and his children, ages 5 to 15, took to the streets with signs in a protest march. Later, Bob Vargo was arrested for creating a public nuisance and disorderly conduct, after a performance by his children, in the front yard of a motel. Next he was arrested for disturbing the peace of Bobby Ball. It does not say how Bobby Ball’s peace was disturbed, but Vargo was found guilty in Municipal Court and fined $10 and costs by Judge John Maberry. A tape-recorded lecture by L. Ron Hubbard was advertised to take place one evening at 8 Center St. The program was called The Game Called Life and there was to be no admission charged. The Barbra Streisand film On A Clear Day You Can See Forever played at the Gaslight Theatre in Eureka Springs. Or one could run over to Berryville and see Don Knotts in How To Frame a Figg at the Main Theatre. Do you have memories or stories of the old Naval Reserve Unit that was located upstairs in the McVay Building at 55 Spring St.? If so, let me know at steve@steveweems.com or at P.O. Box 43 in Eureka Springs. 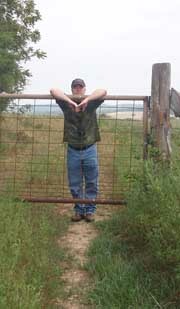 A few days ago, we had a nice visit with Paul and Joyce Hull at their large farm outside Eureka Springs. Even though Joyce has recently been ill and in the hospital, some things do not wait. She was in the process of canning 63 quarts of green beans and 33 pints of beets from their bountiful garden. Last year’s beans had burned up in the heat and drought. If you aren’t familiar with the Hull farm, the county road enters it at the end of a long ridge, one of the highest points in the Western District of Carroll County. Just before the road drops into the valley there is a spectacular view which often makes me think of the farms of Yorkshire, England, (which stems, I think, from reading the stories of James Herriot in my impressionable youth). What had brought us down to the picturesque Hull farm was the neighborhood story of the damage coyotes had done there. Paul Hull had recently lost a number of lambs and kid goats. Coyotes even killed a grown goat that had put its head through a fence and got stuck. One morning Paul turned out a nanny goat and kid into a small pasture behind their house. Later, Joyce glanced out the window and saw the big white nanny chasing a coyote that had grabbed her newborn. Coyotes are getting brave indeed when they are grabbing kids in broad daylight within view of the house. On a different note, I am saddened to hear that the classic toy store Happy Things is quitting business. It has been open downtown since 1970. Located at 55 Spring Street, it is having a big going out of business sale. It isn’t the place to go, though, if you are looking for cheaply made plastic toys that break the first time you play with them.